All heavy automatic weapons need some type of mounting. For the simplest infantry use, heavy machine guns will typically use a tripod with a limited range of elevation. If intended for AA work, the tripod needs to be much higher to permit the gunner to sight the elevated gun; some tripods can be adjusted to meet either need. For use from a vehicle, the gun may be mounted on a simple pintle (a post with a head which permits traverse and elevation), or on some kind of horizontal ring mounting which surrounds the gunner, so that he can rotate the gun through 360°. This was common for defensive use in early aircraft and is still used in some light vehicles. All but the lightest cannon are not only heavier but also recoil much more heavily than HMGs and so need more sophisticated mountings. 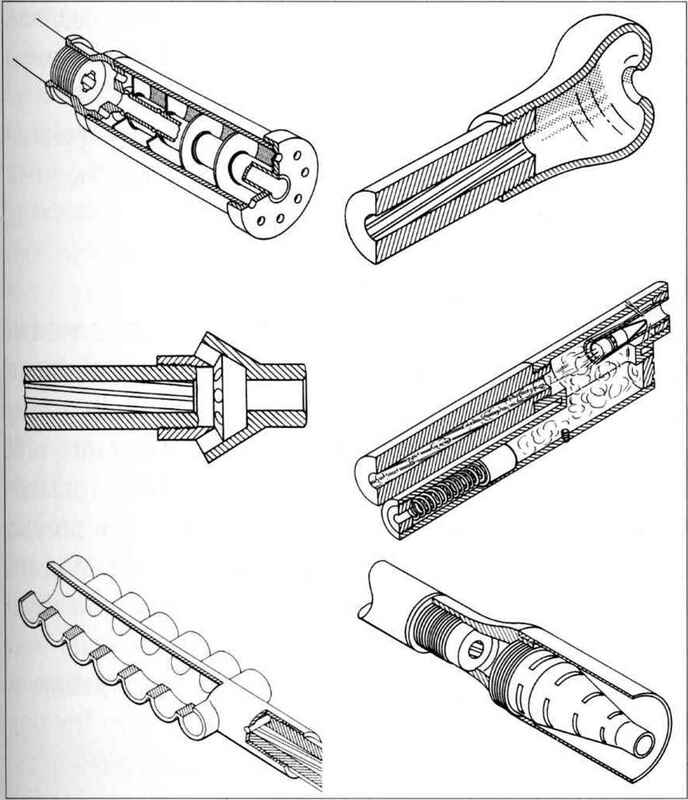 Almost all such mountings allow for the gun to move backwards in recoil in order to soften the impact by spreading it over a longer period; the only significant exceptions being the long-recoil mechanisms and API blowback guns described later in this chapter, whose mechanisms act as recoil absorbers. The energy generated by the guns recoil movement is partly absorbed by friction, pneumatic or hydraulic buffers and partly by a recuperator which uses springs or compressed air to return the gun to the firing position. In smaller-calibre guns these two functions may be combined. 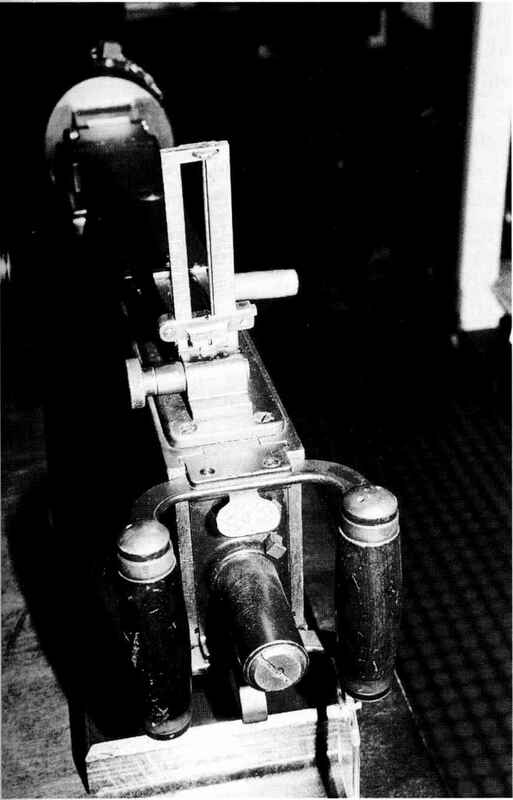 The reduction in the recoil impact from a well-designed system can be dramatic; in the case of the British Rarden long-recoil gun, the peak impact force is reduced by 95%. Recoil-absorbing mountings have improved in effectiveness in recent decades to the point at which a 30mm gun, the American MDHC ASP-30, can be fired from a tripod designed for a .50" HMG. recoil, counter-recoil and floating firing or floating complicate the use of some ammunition, however, such as APDS and APFSDS, and also may not be wanted in recoil-operated guns which need a certain amount of recoil in order to work. All but the simplest army and navy AA cannon mountings are powered so that the gunner can quickly swing the gun to follow the target without any muscular effort being required. 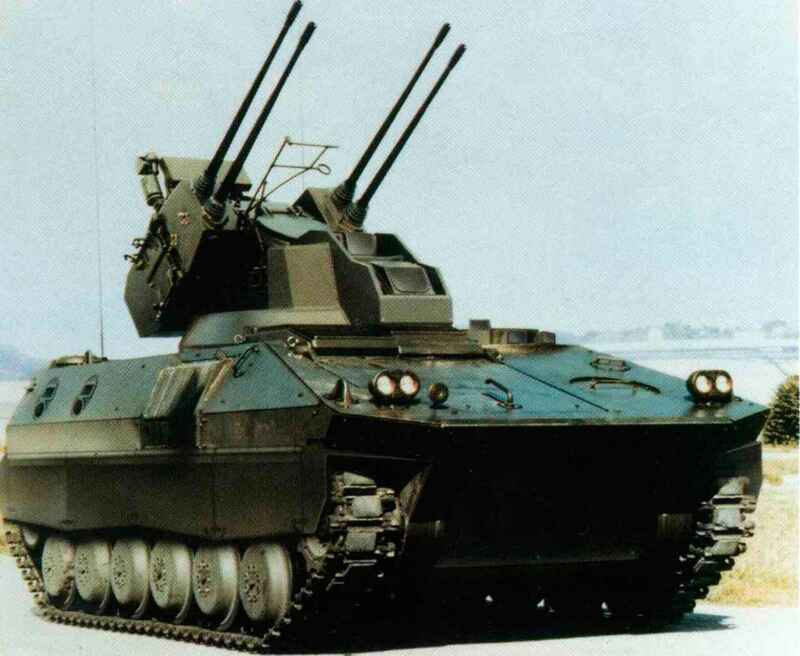 AFV turrets are also nowadays usually powered, at least in traverse if not in elevation. Naval AA gun mountings, and the more sophisticated SPAAGs (self-propelled AA guns, i.e. mounted on an army vehicle) are often stabilised as well, to keep the gun pointing at the target regardless of the movements of the ship or vehicle. Naval (and flexible or turreted aircraft) mountings need some restrictions on their freedom of fire, otherwise they could shoot holes in their own vessel or aircraft. Such mountings therefore usually have 'taboo zones* within which the gun is prevented from firing. At its crudest this may be achieved via a simple framework which prevents the gun from pointing in sensitive directions. More sophisticated versions have mechanical restrictors built into the mounting. This was invented early in the twentieth mounting, or electrical firing restraints. again, greatly reducing its impact. The penalties are ment and still survive in doorway mountings in a delay before the first shot is fired, and some loss some helicopters. of accuracy. Nonetheless, the advantages are such that it is a common system among modern army AA cannon. Of the fixed mountings, most of the early ones were in front-engined propeller-driven fighters. Those using vee engines had the potential to mount Further recoil reductions can be achieved by a gun between the cylinders of the engine so that it using muzzle brakes; devices fitted on to the end of could fire through the hollow propeller hub, pro-the muzzle which allow some of the gun gas to vided that the axis of the propeller was geared escape to the sides and rear before the projectile above the crankshaft line and the propeller design leaves the gun. The jet effect of the gas drives the permitted it. Guns designed for such mountings barrel in the opposite direction to the recoil and can usually had long, slim barrels, such as the HS 404 effect recoil reductions of up to 30%. They can Hispano, MG 151 and NS-37. Engine mounting was not possible with radial engines and most fighters up to the 1930s fitted guns mounted within the engine cowling, whose firing was synchronised to fire between the propeller blades as they revolved (the correct timing often being determined by trial and error, the propeller being replaced by a plywood disk to provide visual verification of the bullet strikes). As gun reliability improved and large batteries of guns were introduced, wing-mounting became more common. The advent of jet aircraft saw the guns moving back into the fuselage, which provided more room, a more rigid mounting and concentrated fire at all ranges. A common problem with fuselage-mounted installations before pilots had self-contained air supplies was contamination of the cockpit from gun gases on firing. The mounting of guns some distance from the cockpit required some means of remote firing. Cables were inadequate to ensure the simultaneous firing of multi-gun installations so electric, hydraulic or pneumatic systems were employed. These were also used in some of the more sophisticated multi-gun turrets. Such weapons therefore usually had no visible triggers, in contrast to those intended for flexible mounting which were either fitted with pistol grips or rear spade-type grips. 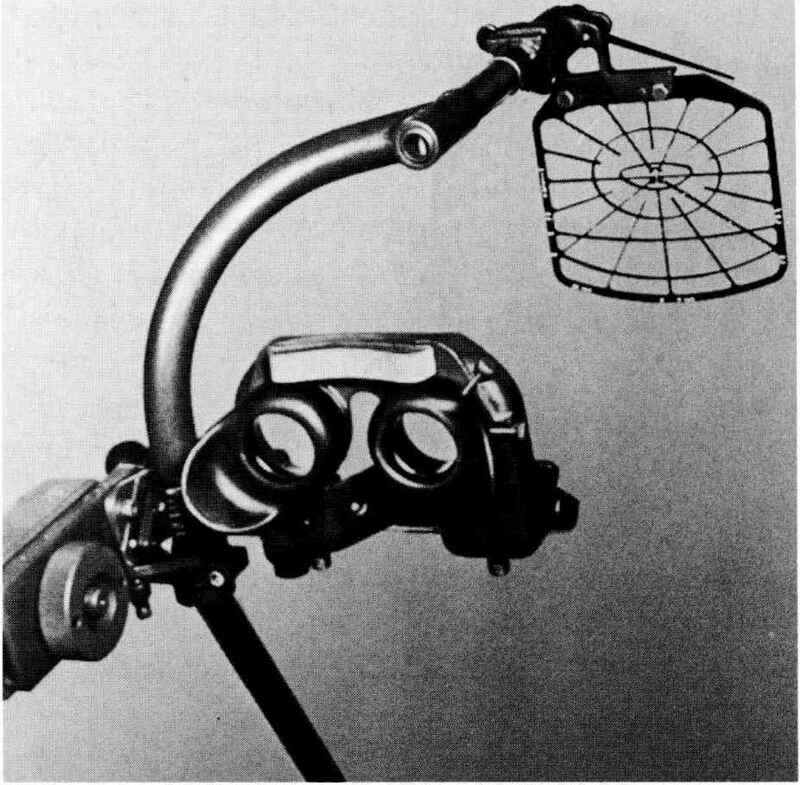 They also usually featured hydraulic or pneumatic cylinders alongside the gun (chargers or cocking units) to cycle the action in order to load the weapon or eject a faulty round. Flash hiders (conical tubes attached to the muzzle) were often used with flexibly mounted or turret guns to avoid the gunner losing his night vision whenever he fired. Another problem unique to aircraft, and especially fighter, installations was the need to ensure that the ammunition would feed into the gun even at extreme positive or negative gravitational forces during violent manoeuvring. This was not always achieved. For most aircraft cannon it is necessary to spread the recoil force and thereby reduce vibration by allowing the guns to recoil. This caused significant difficulties in mounting powerful Second World War cannon. By the end of the war, the idea of internalising this recoil movement within the receiver had emerged in the Rheinmetall-Borsig MK 103. It is now common practice as it enables the guns to be fixed rigidly wherever required, although in modern fast-firing revolver cannon there is no time between shots for any large recoil movement, so the recoil spring is typically replaced by a vibration-absorbing buffer. However, the Aden 25 still recoils 16.5mm and even the fast-firing 20mm M61A1 rotary cannon recoils some 6.35mm in its mounting. Gun pods attached under the wings were used in the Second World War, particularly by the German Luftwaffe for ground attack or in order to boost the firepower against heavy bombers. They are still available in a variety of calibres for fitting to fixed-wing aircraft and helicopters, usually for ground attack. In some Russian equipment, the podded guns can be angled downwards (and even sideways) to facilitate this. Another complication with aircraft mountings is the need to keep the gun mechanisms from freezing up at high altitude (reported, for example, as a significant problem with the Messerschmitt Bfl09s MG-FF cannon in November 1940). This had not been a problem with cowling-mounted guns which were kept warm by the engine, but multi-gun layouts with remote mounting had no such protection. Special anti-freeze lubricants were developed, but as operating altitudes increased during the Second World War, much attention was paid to gun-heating arrangements. These normally used hot air ducted from the engine, but separate electric heaters were often fitted to wing-mounted guns. Another protective measure was to seal the muzzles of the guns by fabric or rubber covers to prevent freezing air from blasting down the muzzle - obviously only effective until the first rounds had been fired. Guns varied in their sensitivity to this problem: the .50" Browning reportedly could continue functioning at temperatures 10°C colder than the 20mm Hispano. Conversely, engine-mounted guns sometimes suffered from unreliability problems due to overheating. Sights for AA guns and aircraft are more sophisticated since they have to allow for rapid target movement in three dimensions; in fact, the quality of the sights makes a huge difference to the effectiveness of the weapons. The simplest AA type uses an open metal or clear Perspex grid with radial elements. The sight must be positioned so that the target is pointing into the centre of the sight, with the distance from the centre being determined by the speed and range. This still requires considerable judgement on the part of the gunner, so various attempts were made, particularly in the 1930s, to produce more sophisticated optical sights into which the estimated speed and range of the aircraft could be set. Similar problems were experienced by defensive gunners in bombers, who also had to bear in mind the question of wind resistance and trajectory curvature. Even if two aircraft were flying side by side at the same speed, simply aiming straight at the enemy would not necessarily ensure success, as wind resistance would tend to cause the projectiles to fall behind the line of sight. In some sights, use was made of the wind to push the foresight off-centre in order to compensate for this problem. A major advance in the late 1930s was the first necessary to locate the guns to avoid this problem. Where this was not possible, other solutions were devised, such as varying the fuel flow at the instant of firing. How does the machine gun fire through the propeller hub?